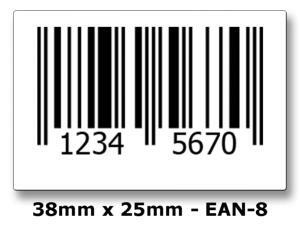 EAN-8 Printed Barcode Labels - 1000 Roll. Custom Printed EAN-8 Barcode Labels. EAN Barcode labels are ideal for retailers. Here at CDM Labels we can print your custom EAN-8 Barcode labels. Simply select your label size from the drop down menu and then add your 7 digit number (Last number will be automatically generated) to the text box in your shopping cart before finalising your order. If you require your labels to be printed sequentially, please add your start number and then give instructions of how you'd like them to be printed E.g Increment by 1 every 1 etc. We will then have your EAN-8 Barcodes printed on to our Semi Gloss labels.